Bright, captivating and delivering ever-changing content, Digital Signage, and the Video Wall, is a visually stimulating and affordable form of out-of-home-advertising. Offering an eye-catching alternative to static signs, digital signage displays are a great way to promote your brand, product or service information 24/7, while the video wall offers a new-age way to communicate and engage your customers. Touch technology can also be incorporated as well by using the Touch Foil or Touch Frame. Say good riddance to that store window lightbox or poster frame and you’ll be so glad you did. When you install digital signage, the initial infrastructure outlay is quickly recovered in the money you’ll save on (the now obsolete) printing, mailing and labour costs. Your next marketing campaign no longer requires new posters to be printed and delivered to a dozen separate store locations. Now, with our user-friendly content management software, all you need to do is upload a content file from anywhere at any time and you’ve got yourself a brand new image, or video and an instant window update. From a small window screen to a large outdoor wall, delivers an extensive range of digital advertising signage solutions catering to all your promotional needs. 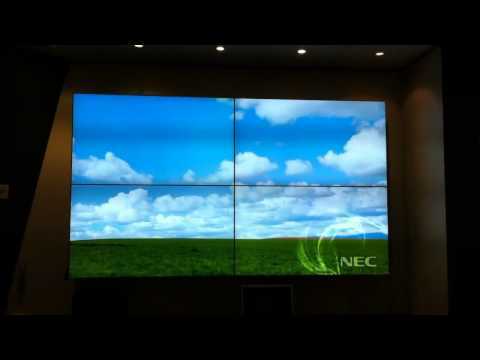 For the ultimate, “look at me” display, it’s hard to top the large-scale Video Wall. Showcasing a grid of interlocking screens, the Video Wall is sure to attract and energise an audience. With its customised layout options, you can change the wall configuration, utilise the entire surface area, or display your message on just a few screens. See the latest Vodafone Video Wall project by . Offers a full colour content display system. Is cost effective – the initial infrastructure investment is easily recovered based on reduced labour and printing expenses (associated with traditional ‘static’ advertising). Delivers a big-screen experience without compromising the resolution/pixel density. Allows you to instantly upload and update content at the last minute. Uses specialised software that can be tailored specifically to meet your multimedia advertising, marketing or general business needs. Can incorporate Touch Technology - Touch Foil or Touch Frame.